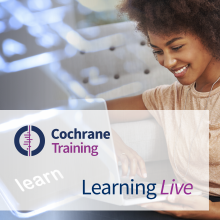 In these videos, originally part of the Cochrane Learning Live webinar series, Dr Nicole Skoetz, Dr Elvira van Dalen, and Marius Goldkuhle provide detailed instructions on how to improve the preparation of GRADE ‘Summary of findings’ tables with regard to time-to-event outcomes. Recent empirical work involving the presenters suggested some flaws in the calculation and reporting of absolute effects in current Cochrane Reviews. However, absolute effects are a routine part of the user-friendly presentation format of ‘Summary of findings’ tables. Based on practical examples the presenters explained some common mistakes and how to avoid them. The webinar was delivered in December 2018. Below you will find videos from the webinar along with the accompanying slides to download [PDF]. Dr Nicole Skoetz, Senior Editor Cochrane Cancer, Department I of Internal Medicine, University Hospital of Cologne; Scientific Co-ordinator Working Group Standard Operating Procedures of the Comprehensive Cancer Centers, Center of Integrative Oncology Köln Bonn; University Hospital of Cologne, Germany. Nicole was a Co-ordinating Editor of Cochrane Haematological Malignancies Group from 2008 to 2017. Dr Elvira van Dalen, Epidemiologist at the Princess Máxima Center for Pediatric Oncology, Utrecht, The Netherlands; Co-ordinating Editor of Cochrane Childhood Cancer. Her main research interests are systematic reviews and guidelines in the field of pediatric oncology and late adverse effects after childhood cancer treatment. Gertjan J.L. Kaspers, Martin Zimmermann, Dirk Reinhardt, et al; Improved Outcome in Pediatric Relapsed Acute Myeloid Leukemia: Results of a Randomized Trial on Liposomal Daunorubicin by the International BFM Study Group; Journal of Clinical Oncology; volume 31; Issue 5; Figure 3, p.604; Reprinted with permission. ©(2013) American Society of Clinical Oncology. All rights reserved. Giorgio V. Scagliotti, Ugo Pastorino, Johan F. Vansteenkiste, et al; Randomized Phase III Study of Surgery Alone or Surgery Plus Preoperative Cisplatin and Gemcitabine in Stages IB to IIIA Non-Small-Cell Lung Cancer; Journal of Clinical Oncology; volume 30; Issue 2; Figure 2A (curve) p.176; Reprinted with permission. ©(2012) American Society of Clinical Oncology. All rights reserved.